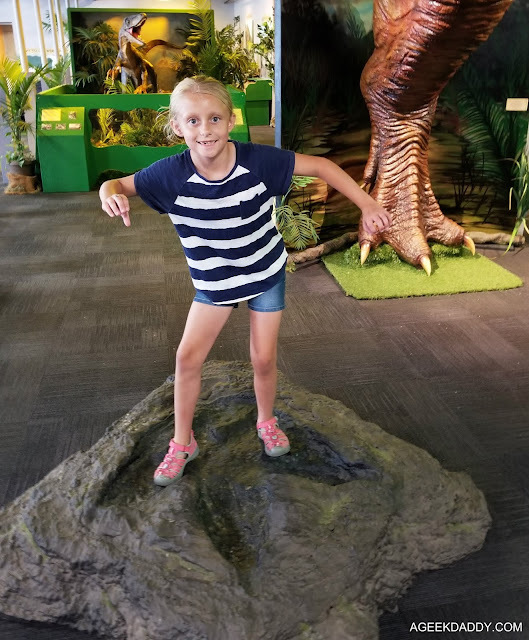 We went on a road trip to Michigan's capital city over the weekend to explore a special traveling exhibit called "Amazing Dinosaurs!" that is making a stop at the IMPRESSION 5 SCIENCE CENTER. 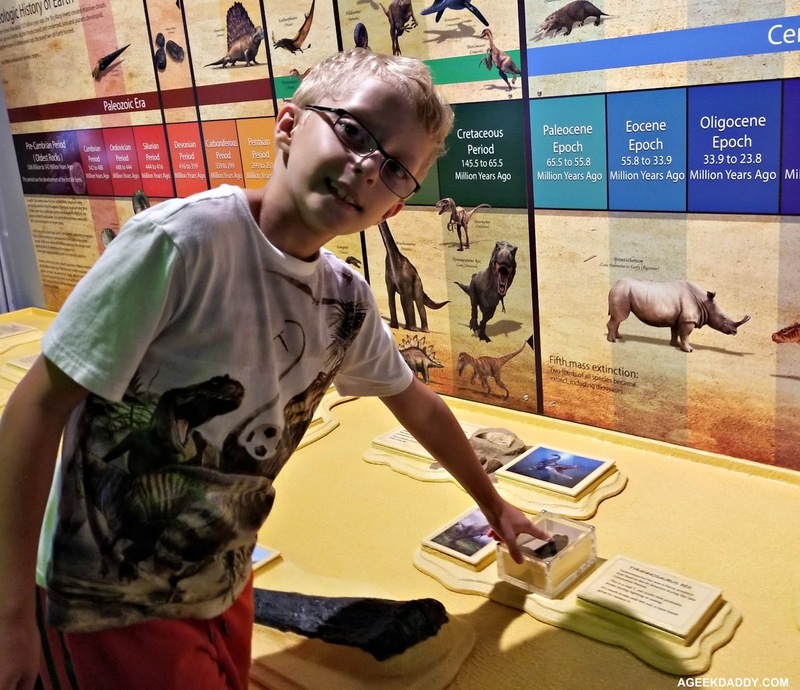 On display at the science center through January 13, 2019, families can learn about these amazing creatures in an entertaining way that will capture the interest and imagination of kids and parents alike. 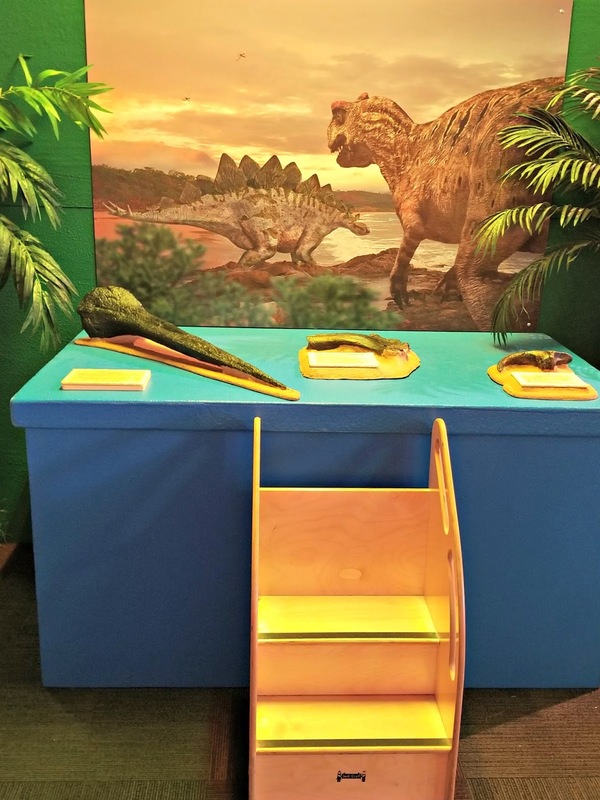 Take a trek back in time by walking through this interactive exhibit that features replicas of prehistoric relics, dinosaur themed props and models, and real fossils that you can actually touch. 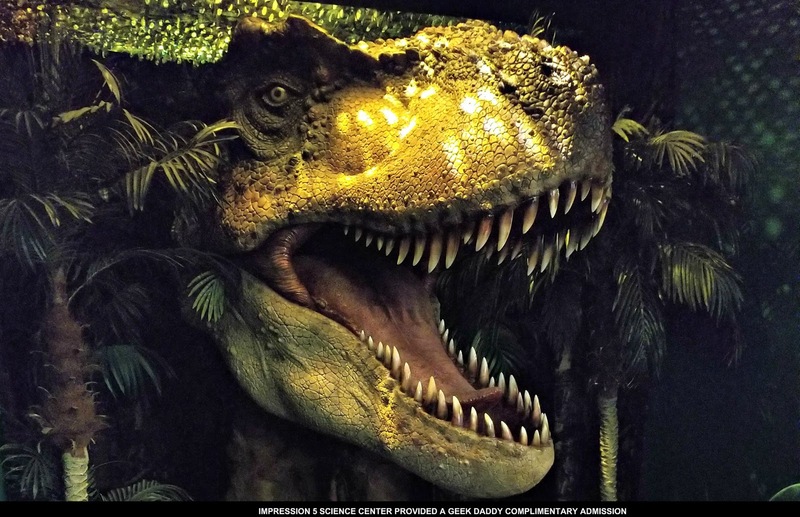 Start off your dinosaur expedition with a Tyrannosaurus Rex encounter. A reproduction of a T-Rex skull greets visitors as they enter "Amazing Dinosaurs!" What a welcoming smile! Perfect for taking a photograph with. 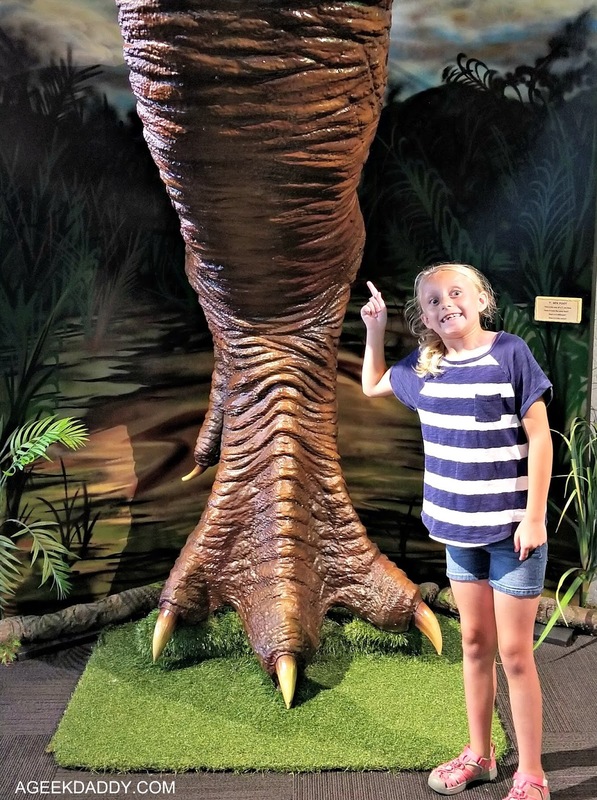 Then take a few more steps into the exhibit gallery to find yourself face-to-face with a life size scale model recreating what a living T-Rex's head would look like. Whoa!!! As the dinosaur stares down contemplating whether or not the people in the room will be its next meal, don't be scared to get closer to it. 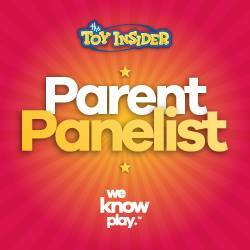 On a panel below the dinosaur are two buttons. One makes the T-Rex roar and the other produces the sound it would make stomping across the ground. Next to the buttons is a funnel that people are encouraged to holler into. How does your roar compare to that of a T-Rex? Also incorporated into this Tyrannosaurus Rex display is a fossil of a portion of one of these dinosaur's femur bones that was found in South Dakota during 2013. T-Rex had 320 bones for their skeleton and the femur which connects the hips to knees was the strongest of them. How exciting to be able to look over and touch a fossil that was part of a living animal from 67 millions years ago! Beside the femur bone is a cast take from a full fossil of a T-Rex femur bone. Compare the replica to the actual fossil next to it. Try to determine what the difference is between the full femur bone and the partial one on display. A plaque also explains how blood vessels interfaced with the dinosaur's femur and encourages you to look for openings in both the replica and the real fossil that show where these would have passed through the bone. A subtle reminder that the dinosaurs these bones belonged to were once flesh and blood just like us. Speaking of T-Rex legs … how would you stand up against one? 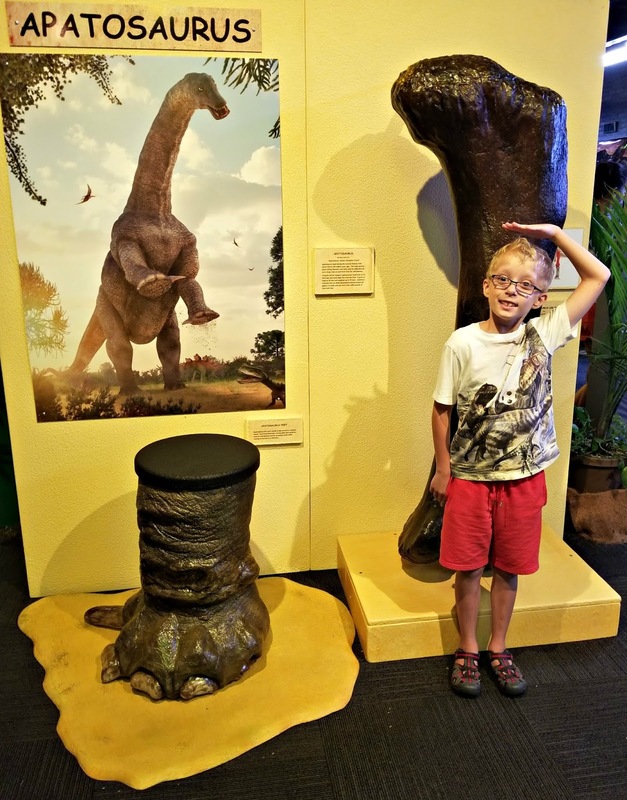 Measure how tall you are versus the height of a Tyrannosaurus Rex leg. 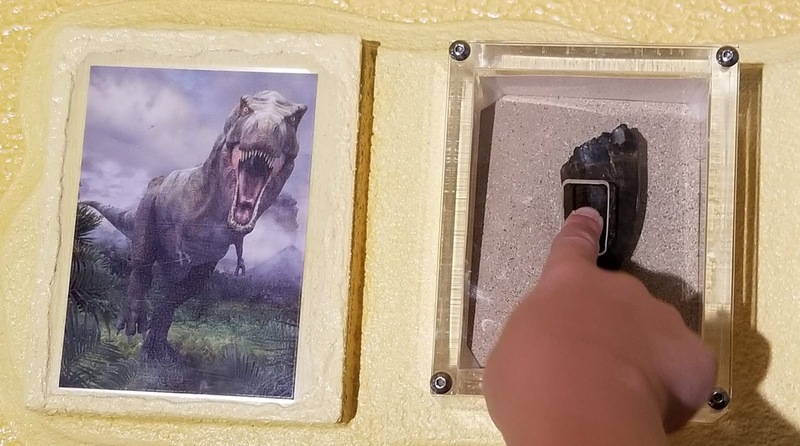 There is a display where you can do that while visiting "Amazing Dinosaurs" at Impression 5. Then see how your footprint would compare to that of a T-Rex. Those dinosaurs sure had huge feet! Even people who wear size 14 shoes will feel as if they have dainty feet in comparison to a Tyrannosaurs Rex footprint. My daughter got a real kick out of this! A highlight of this exhibit for my son was getting a close up view of a real T-Rex tooth and getting the chance to touch it. What kid isn't familiar with the toothy snarl of these dinosaurs. He was wowed by the opportunity to check out one of these menacing teeth up close. 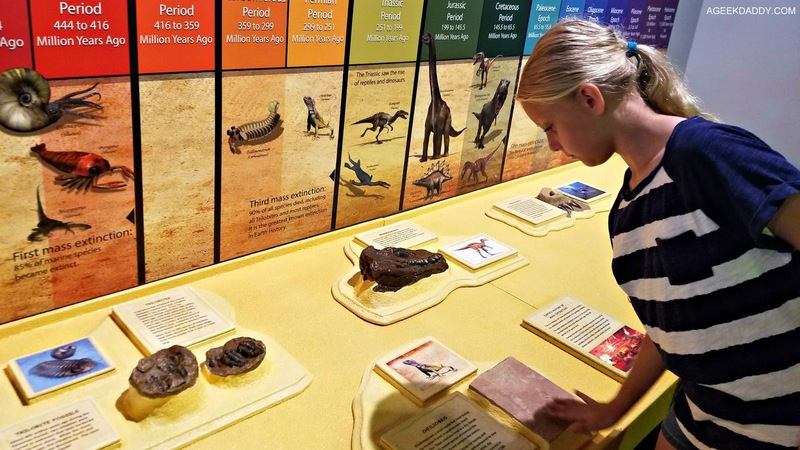 In fact, there are numerous hands-on opportunities to examine reproductions as well as original fossils throughout the "Amazing Dinosaurs!" exhibit. A nice touch is that there are stools set up at many of the display areas to provide kids great views and assist them in being able touch many of the things being showcased. 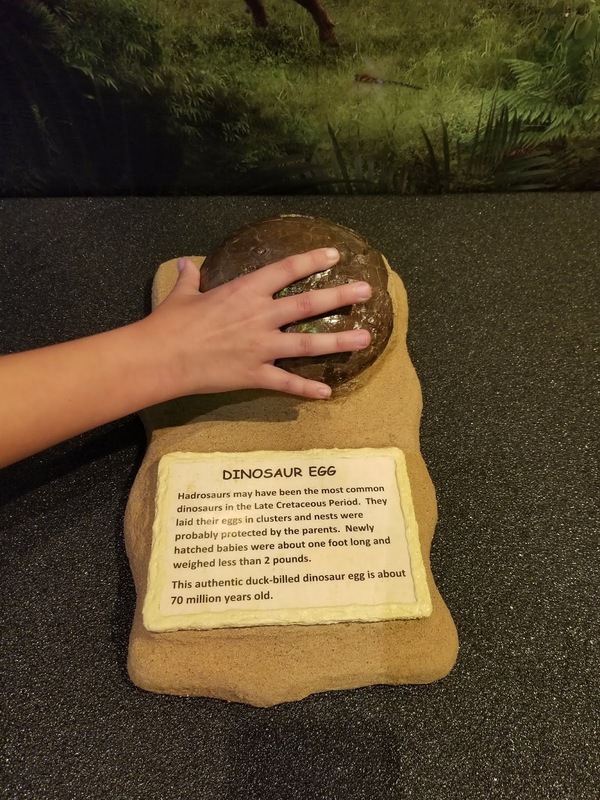 Dinosaur claws, bones, eggs, skulls and teeth are a few examples of things that are there to see and feel. One of my son's favorite movies is Walking with Dinosaurs. He was thrilled to see a fossil of a bird called an Alexornis that played a major role in the film on display as he walked through this gallery of dinosaurs. 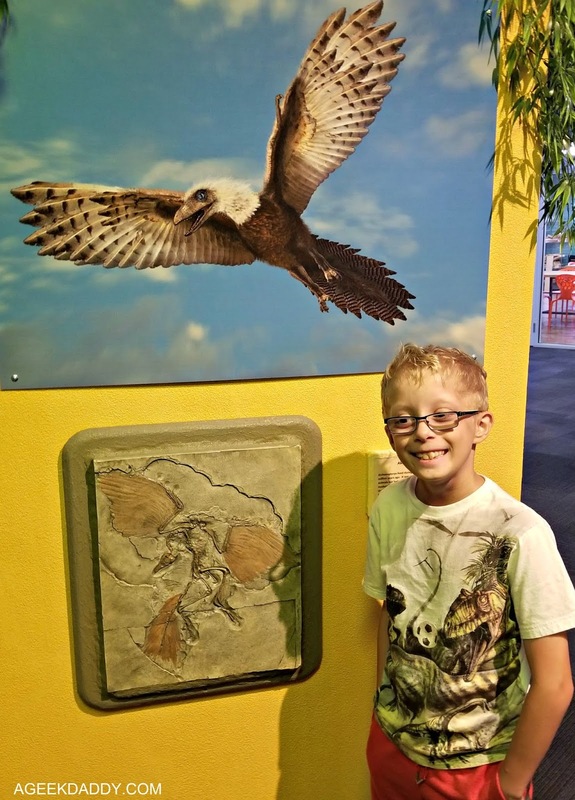 Delving into what the world of the dinosaurs was like, the exhibit also includes some other species, like the Alexornis, to give some insight into habitats of this time period. I'm not going to give away all of the dinosaurs and other creatures highlighted in the exhibit though so that there are some surprises for when you go to see it yourself. If you are going to be in the Lansing area, take some time for a family road trip to the Impression 5 Science Center to check out the "Amazing Dinosaurs!" exhibit for yourself before it leaves town for its next destination. What really stood out about "Amazing Dinosaurs" for me was the ability to really get up close and examine fossils. They weren't cordoned off behind barriers or enclosed within thick glass cases. Whether they were reproductions or originals, the fossils were all out there right in front of you. 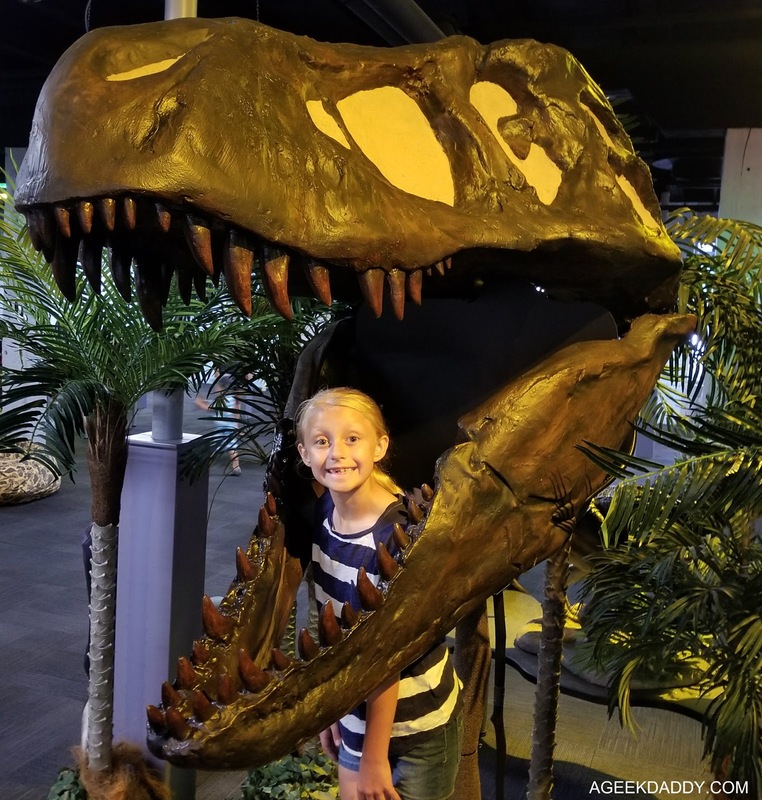 That is why "Amazing Dinosaurs" at the Impression 5 Science Center earned A Geek Daddy nod of approval. 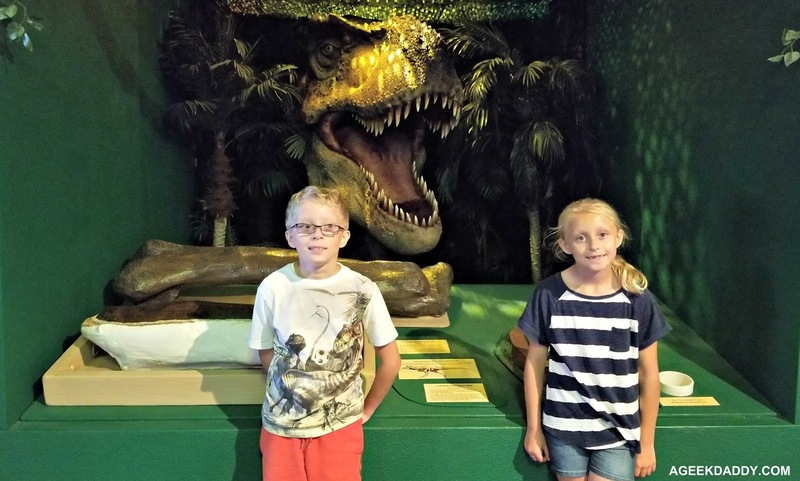 Both of my kids as well as my self had an amazing time on this dinosaur expedition. THAT is fully awesome! I would love to go there with the kids. Or alone. I'm good either way. I never outgrew dinosaurs. I love going to museums, especially if they have dinosaur exhibits. It's just so amazing the size of these animals. My youngest would love to visit the dino exhibit. There was a small exhibit of dinosaurs on display at the Fort Worth Museum at one point. Not sure if its still there. It has been 10 years since Ive been. Too fun! Dinosaurs are timeless ;) I remember learning about dinosaurs when I was young, and now both my kids love them too! Looks like a fun time for kids! Cool that we have something like this in our area. We are totally planning on going to check out this newest exhibit! 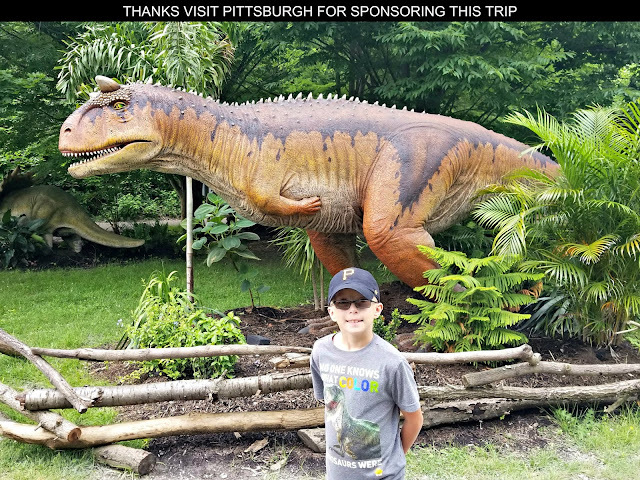 We love dinosaurs in our house and I know the kids will absolutely love it!